How to manage Channels from the Admin Panel. All Channels can be managed by Admins. The Channel Management section gives Admins the possibility to view, search and filter the Channels they need to find. By opening Channel Management, Happeo will open the Channel's settings page and enable Admin Mode for the user. This will enable the admin to make changes to the channel. Please check the "Admin mode" article for more information. 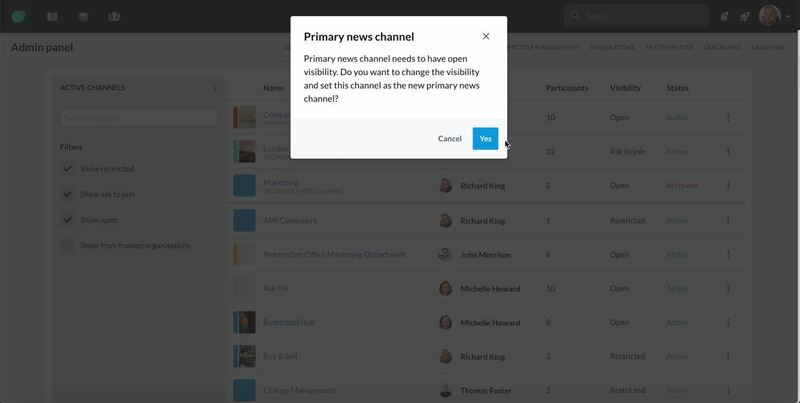 Admins can set the Channel Notifications priority to High to all participants from the Channel options. This will promote the notification settings for all participants, but is not enforced. Therefore participants can demote the Notification Settings if they want to.